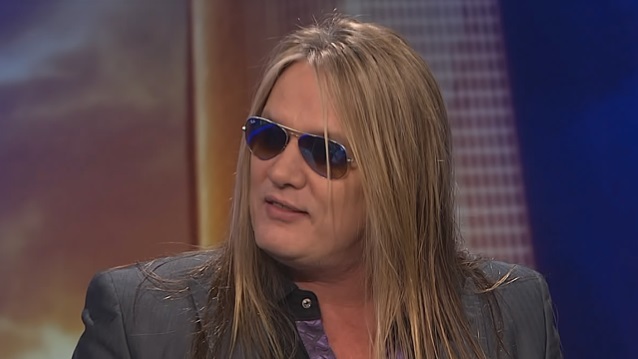 Former SKID ROW frontman Sebastian Bach was interviewed this morning (Thursday, November 30) on "KTLA Morning News", the morning television news program airing on KTLA in Los Angeles, California. You can now watch the chat below. Asked if the elements exist for a possibility of a SKID ROW reunion, Bach responded: "Well, [they] exist 'cause we're still alive." Pressed further, the singer admitted: "That's a rough subject for me, 'cause we're trying to put it together, so I don't wanna say the wrong thing." Sebastian closed the topic by saying that a reunion "could be on the horizon." Bach's latest comments seem to contradict SKID ROW guitarist Dave "Snake" Sabo's recent claim that the chances of Bach coming back to the band are "slim to none." In 1999, SKID ROW reformed and, after a bit of shuffling over the years, featured a lineup consisting of original bassist Rachel Bolan and guitarists Sabo and Scotti Hill, alongside drummer Rob Hammersmith and singer Johnny Solinger. Sabo told the "Trunk Nation" show earlier in the month that "there was definitely dialog that was going back and forth" between SKID ROW and Bach about a possible reunion, but "what it ended up being was we realized that whatever it was that tore us apart years ago still existed… We got offered a lot of money. And then with the dialog that went back and forth, it got ugly again," he said.